So this could be the best accidental find in years - scans of video game books from Taiwan. The quality varies a bit, but it's well within the bounds of acceptability given the contents. This is a lot of content, and it needs to be mirrored on our wikis as a priority. It is far too much for me to handle on my own - I've had a hard enough time just proving these things exist before now, so I need volunteers to get these up there. Most are destined for Sega Retro or NEC Retro. Get this tool, crop some things, upload. Right this second I'm not too worried what happens after that (i.e. what happens about wiki pages). A solution to that will come later - the priority is to mirror. I've checked a few of these against the Japanese game guides and they appear to be exact copies with the text replaced. I wonder if they were authorized or not. There don't seem to be any credits connecting them back to the staff/publishers from Japan. 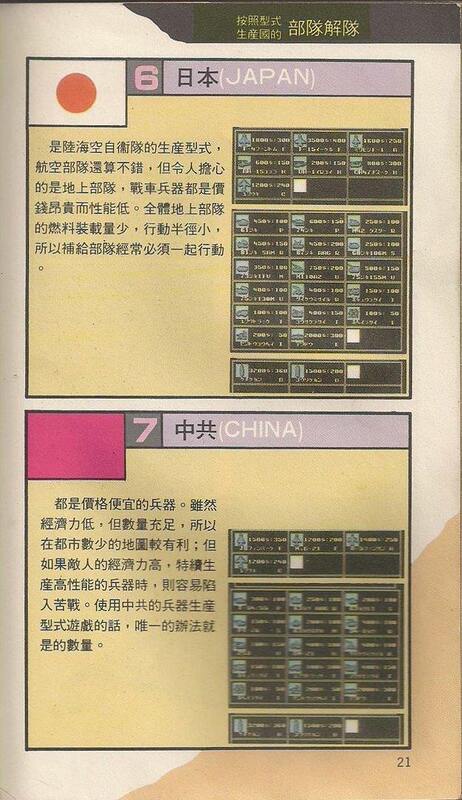 It's known that Chinese game magazines would copy layouts exactly from Japanese magazines and just change the text without any kind of permission. Not sure what happened in Taiwan. Do you know which Japanese books map to these Taiwanese editions? Some seem obvious but I don't have a Japanese library to compare against. Just because at some point I'll have to give the files names, and it's easier to translate Japanese into English. I took an easy one to show it should be done. I used this Firefox extension to quickly download every page, did a bit of re-arranging and saved as a PDF. For the two page spreads, use this tool. One day I'll get people interested in this stuff. China (as in, the People's Republic) exists in Super Daisenryaku, but Taiwan isn't keen on China existing (and vice versa) so it's removed the five stars from the flag and made it a bit more pink. That'll show them. I'm in the process of saving everything. Taiwan uses traditional Chinese text instead of simplified, so that's another way to tell. Excellent work guys. Sonic Retro remains the best and most exhaustive monolith of collected Sonic history in existence. Stuff like this is awesome to see. I will do this soon. I recognize most of the game guides. However, the "Top! Mega Drive" volumes are a mystery to me. I recognize a bit of the content (mainly interviews) from Beep! MD, but there are some pictures (for example, of the tablet and keyboard) that I haven't seen elsewhere. These could be from a Japanese magazine or book I haven't seen. Here is more information on the game guides (everything but the Top! Mega Drive issues). I'm linking to the original Japanese books on Surugaya for convenience. Most of the books are part of the "Terebi land wan pakku" (TV land one pack) series of game guides. Let me know if you need more info. I don't know the sources for these. Some parts are taken from the game manuals. They might otherwise be original works, or taken from game magazine walkthroughs. The cover here shows both Shining in the Darkness and Bahamut Senki, but the book only contains Bahamut Senki. I think the Shining in the Darkness portion was not scanned. Not sure about this one. The back cover seems to suggest this is a general guide the PC-98, X68000, and MD versions. I'll finish the remaining few later.